Widowhood in an American City focuses on the roles and lifestyles of urban American widows fifty years of age or older. These women form a segment of two generations of one society; they present a historical instance of people born and brought up under conditions that are not likely to be duplicated. Not only the U.S., but many other countries are undergoing modifications in the degrees and forms of urbanization, industrialization, and social complexity.Helena Znaniecki Lopata argues that the way women re-engage society following the death of a husband is different due to their location in the modern social system. She notes that the trends in social structure are toward increasingly voluntaristic engagement in achieved, functionally oriented social roles that are performed in large groups and contain secondary social relations. The cultural background of many societal members prevents the utilization of most resources of the complex urban world, restricting them to a small social life space, with almost automatically prescribed social relations.Those who argue that the elderly are socially isolated contend that this is a result of the natural process of withdrawal of the person and the society from each other. These arguments focus on those who are isolated or lonely and those who lack the skills, money, health, and transportation for engaging or re-engaging society. Lopata's study indicates that this assumption is false for many widows. If such people are to be helped, a fresh view of the relation between the urban, industrial, and complex modern world and its residents is required, and new action programs must be creatively developed. 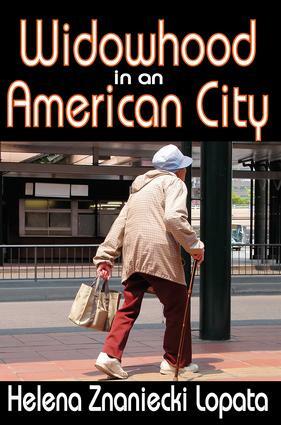 This is a timely, ground-breaking work that addresses and shatters common myths associated with growing old alone in an urban society.